A biochemist by profession, a polymath by inclination and erudition, Yeshayahu Leibowitz has been, since the early 1940s, one of the most incisive and controversial critics of Israeli culture and politics. His direct involvement, compelling polemics, and trenchant criticism have established his steadfast significance for contemporary Israeli-and Jewish-intellectual life. These hard-hitting essays, his first to be published in English, cover the ground Leibowitz has marked out over time with moral rigor and political insight. He considers the essence and character of historical Judaism, the problems of contemporary Judaism and Jewishness, the relationship of Judaism to Christianity, the questions of statehood, religion, and politics in Israel, and the role of women. Together these essays constitute a comprehensive critique of Israeli society and politics and a probing diagnosis of the malaise that afflicts contemporary Jewish culture. 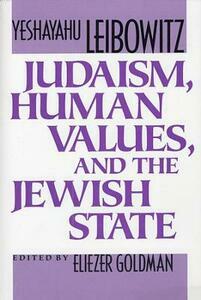 Leibowitz's understanding of Jewish philosophy is acute, and he brings it to bear on current issues. He argues that the Law, Halakhah, is essential to Judaism, and shows how, at present, separation of religion from state would serve the interest of halakhic observance and foster esteem for religion. Leibowitz calls the religious justification of national issues "idolatry" and finds this phenomenon at the root of many of the annexationist moves made by the state of Israel. Long one of the most outspoken critics of Israeli occupation in the conquered territories, he gives eloquent voice to his ongoing concern over the debilitating moral effects of its policies and practices on Israel itself. This translation will bring to an English-speaking audience a much-needed, lucid perspective on the present and future state of Jewish culture.